A small square dish with indented corners, supported on four short feet. 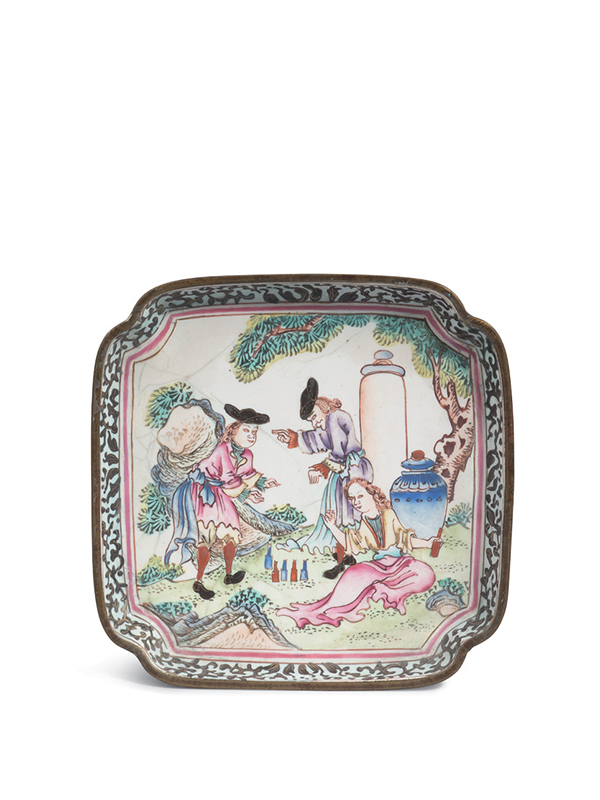 The flat surface is decorated in coloured enamels with three foreign figures in a landscape setting. The seated figure holds a bottle in his left hand, while five other bottles stand on the ground on his right. The two other figures, one standing behind and one approaching from the left, join in for drinking. A column and a covered vase are at the back. The grass ground and the pine trees are painted in layers of green, with rugged rocks around. The scene is contained within a double-circled cartouche in red. The sides of the interior and exterior are adorned with dark scrolling tendrils against a bluish-white ground. The white base has a stylised flower painted in the middle; probably the mark of a workshop.